Gallia Academy sophomore Bailey Meadows (center) throws to first base, during the Blue Angels’ 18-2 victory over Fairland on Monday in Centenary, Ohio. CENTENARY, Ohio — An offensive showcase. 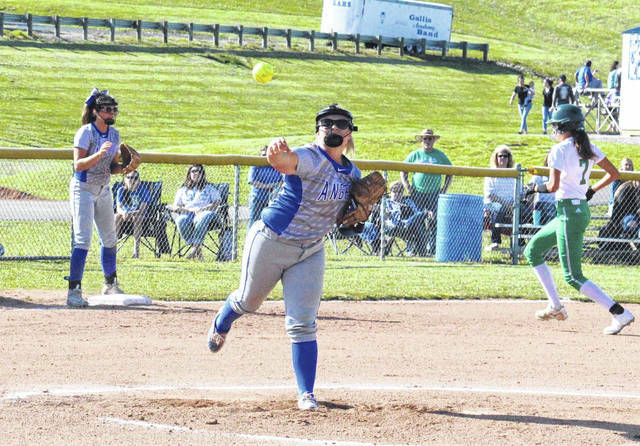 The Gallia Academy softball team pounded out 23 hits, including 10 extra-base hits, en route to a 18-2 victory over Ohio Valley Conference guest Fairland on Monday in Gallia County. Fairland took a 1-0 lead on a Emily Bowen RBI single with two outs in the top of the first inning. The Blue Angels (16-3, 10-2 OVC) answered with two outs in the bottom of the first, as Ryelee Sipple, Alex Barnes, Malerie Stanley and Chasity Adams each scored. The Blue Angels broke the game open in the bottom of the second, scoring seven runs on the strength of eight hits. In the following inning, GAHS strung together five straight hits, leading to three runs. 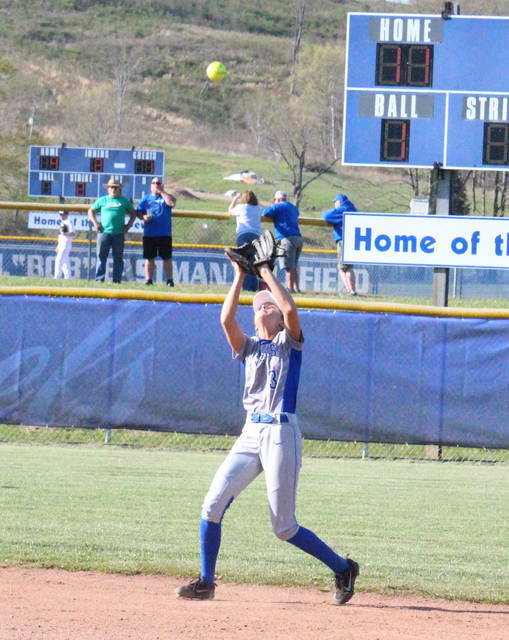 The Lady Dragons were held to a baserunner apiece in the second and third innings, but put another run on the board in the top of the fourth, as Montana Runnels singled in Libby Judge. The hosts capped off the 18-2 victory with four runs on five hits in the bottom of the fourth inning. 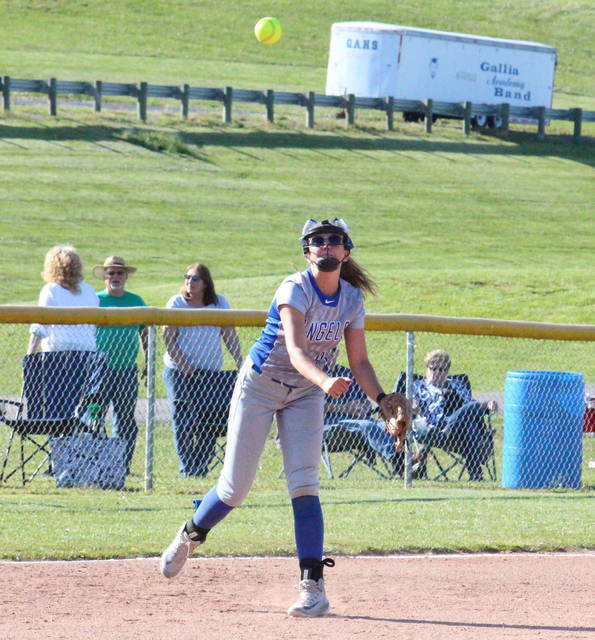 This marks the season sweep of FHS for Gallia Academy, as the Blue Angels squeaked out an 8-5 victory on Friday in Proctorville. Bailey Meadows was the winning pitcher of record in a complete game for the Blue Angels, striking out six batters, while allowing two earned runs on six hits. Adrianna Hoffman suffered the loss in a complete game for Fairland, striking out five and allowing 18 runs, 17 earned, on 23 hits. 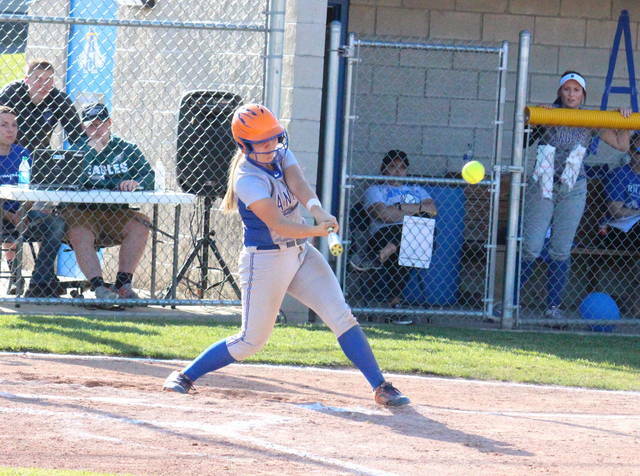 Leading the Blue Angel offense, Barnes was 4-for-4 with a triple, two doubles, four runs scored and three runs batted in, Bailey Young was 4-for-4 with a double, two runs and one RBI, while Adams was 3-for-3 with two doubles, two runs and five RBIs. Sipple was 3-for-4 with two triples, four runs and three RBIs in the win, Meadows was 3-for-4 with a pair of RBIs, Allie Young was 2-for-3 with a run and an RBI, while Stanley was 2-for-2 with a run and an RBI. Hunter Copley doubled once, scored once and drove in a run, Elizabeth Eads singled once and scored once, while Alexis Chapman scored twice for the victors. Fairland’s offense was led by Runnels, who was 2-for-2 with an RBI, and Hoffman, who was 2-for-3 with a double and a run. Bowen singled once and drove in a run, while Judge singled once and scored once. Fairland committed the game’s only error. Both teams stranded four runners on base. After a trip to Coal Grove on Tuesday, Gallia Academy will head to Vinton County for a non-conference tilt on Wednesday.